Three Minute Thesis (3MT) competition is a platform where graduate research students are given three minutes to present a compelling oration of their thesis and its significance. 3MT challenges students to consolidate their ideas and discoveries into a concise presentation to a non-specialist audience. 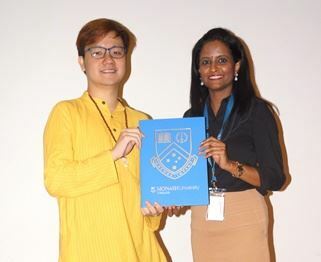 The winner at the campus level will represent Monash University Malaysia at the Monash University 3MT finals in Australia for an opportunity to compete in the Asia-Pacific 3MT finals to be held at the University of Queensland. This year, the Malaysian campus level competition was held on Wednesday, 7 June 2017. Five participants from the various schools participated, with Mr Wong Zhi Hoong (Cyren) representing the School of Arts and Social Sciences. Cyren won the People’s Choice Award and was 2nd runner-up with his presentation, entitled " Representations of Nature, Eco-touristic expression, and Semai Agency: Tracing the Actor Networks of Bukit Kinta Rainforest".